A baptism certificate from St. Mary's Church in Lawrence, Massachusetts, certifying that Elizabeth Yazbek, daughter of Abdella Yazek and Julia Abila was born on February 15, 1914 and baptized May 25, 1914. A promise of employment certificate for Joseph Shaheen, employed as a doffer for Washington Mills. A promise of employment for Annie O'Hanian, promising her employment as a doffer in Washington Mills. Signed by Stephen Gillian on May 15, 1914. A writing sample proving that Annie O'Hanian can read, write, and speak English well. Signed by Anna A. Murphy, a teacher at the Special School on May 13, 1914. An Arabic letter handwritten by Father Khouri Boutrus Rael on February 15, 1914. 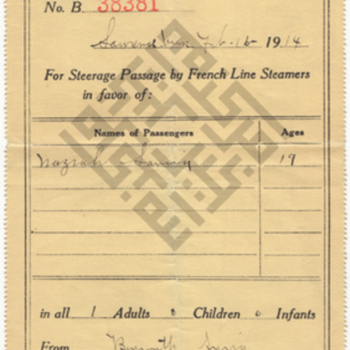 It confirms the baptism of Najeeb Youssef Nassif on July 1, 1898. A birth certificate, issued by the State of Connecticut Department of Health, certifying that Josephine Mallouf was born March 15, 1914 in Bridgeport, Connecticut. It lists the father's name as Moses Mallouf and mother's name as Sara Mallouf. A physician's certificate of age confirming that Charlie Kalil was at least 16 years of age at the time it was filled out, on March 12, 1914. It provides his date of birth, April 15, 1894, and residence, 397 Chestnut St.